How to get kids into religion... set a popular, youth TV show at the temple. Kando Myojin has been around since AD 730. It has moved three times, finally settling just up the road from Akhiribara in 1616 where it is nestled between modern buildings providing a respite from the hubbub of the city. It was destroyed by the great Earthquake of 1923 and rebuilt from concrete in 1934 and so survived the bombing of Tokyo in World War II. It is home to three main gods, two of which – Ebisu and Daikokuten – are part of a set known as the Seven Gods of Fortune. Daikokuten is the god of farmers, wealth, and marriage. His image was printed on the first Japanese bank note. His statue at the shrine is to be found on the left, just past the purification fountain. You’ll recognise him by his outsized earlobes, big grin and the mallet he holds in his hands. You’ll also spot lovers wandering around the temple and hanging slips of paper on the heart shaped ‘tree’ as an offering to Daikokuten. Just past Daikokuten you’ll find a sculpture of Ebisu, or the ‘laughing god’. The sculpture shows Ebisu in the sea. The story goes that he was born with no bones and cast away by his parents in a wicker basket just before he turned three (which may sound familiar if you’re into the classics or the Old Testament). After he washed up ashore he developed bones, although he remained slightly crippled and deaf. Ebisu is the god of fishermen and luck and also noticeably the god pictured on the widely-available and hugely popular Yebisu beer which has been brewed since 1890. The third is Taira no Masakado, a deified samurai who led an uprising against the emperor in the 930’s. He was killed in 940 and a mixture of respect for his rebellion against the central government and fear - as any neglect of his grave nearby seemed to be followed by some kind of natural disaster in Tokyo - led to his deification by locals. In the late 19th century the Emperor, wanting to include Kanda Myojin in Tokyo’s Ten Shrines, ordered Masakado’s removal from the shrine. However, due to public pressure he was symbolically restored after World War II. The combination of the two gods of fortune led to Kanda Myojin becoming a popular place of worship for local businessmen to pray for prosperity. As the Akihabara electronics area developed nearby and became home to all things tech, the focus shifted accordingly. The shrine began offering ceremonies to bless the computers of local businesses. If you’re lucky enough to stumble on one of these you may even see a whole company’s IT set-up being brought into the temple for such a ritual. More pedestrian customers from Akhiribara often head up to the shrine after making an important purchase, as I did, to buy an ‘IT charm’. The charm (1000 yen) has three parts: A gold card to keep in one’s wallet, a sticker for mobile devices such as phones (mine is on my camera) and a strip to affix to a computer. The charm is to protect your devices from malware and other general harm. The next nod to modernity began in 2010 when a popular anime series Love, Live! began in Dengeki G's Magazine. The story follows nine schoolgirls who get together to fight against the closing down of their high school. They do so by forming a pop idol band. One of the main characters is a shrine maiden at Kanda Myojin and the group often get together at the temple. You can often see fans taking photos of a seemingly innocuous set of steps found on the far right of the complex. These steps are where the girls hang out and train in the series. The shrine began to attract legions of fans as the series moved on to embrace CDs, a TV series and even a movie. 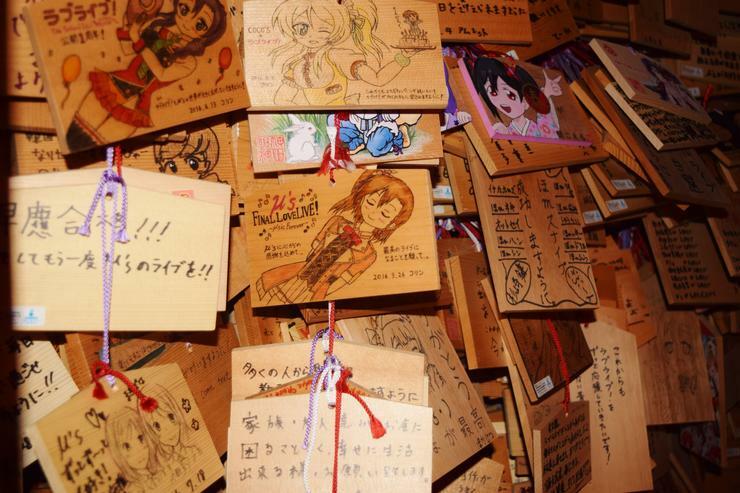 They pay their respects by adorning their ema (wooden charm plaques) with drawings from the series and then hanging them in the shrine. The ema are burnt once a year as an offering to the gods. It’s worth taking the time to browse through them, some of the artwork is great, especially when you consider the probable age of the artists. Kanda Myojin returned the fans’ loyalty in 2015 by announcing on Twitter that the shrine maiden from the series, Nozomi Tojo, was now an official mascot of the temple. In another nod to pop culture you will also find a monument to another fictional character, Zenigata Heiji, a policeman in the Edo era who features in a series of novels, TV series and films. His beat is in the area around the temple and he catches crooks by throwing coins at them. His otherwise rather austere grey stone monument is recognisable by the gold coin affixed on the top of it. As well as enjoying the cultural and pop heritage of the shrine you may also take part in some of the rituals. After entering in through the breathtakingly beautiful cedar wood main gate turn to your left to see the purification fountain (a washing station). Before walking round or worshipping at the shrine you should take one of the long-handled cups and pour a small amount of water over each hand in turn. Then pour some water into your hand and use it to rinse out your mouth. The water is spat out in the gutter next to the fountain, not back into the sink. When you approach the main alter in the central building prepare a coin. Wait for a space if it’s busy. When you approach the alter throw the coin into the offering box in front of you then bow twice. Clap your hands twice to attract the gods’ attention, and then bow once again before praying for a few seconds. You may also purchase English ‘Omikuzi’ or fortunes at the office to the right of the main building for 200 yen. There is a tall container on the sill. Take the container in both hands, and shake it while thinking about your question. Then tilt the box downwards to release a stick. The sticks are numbered and a member of staff will find the right number and hand over a fortune slip. There’s a general fortune on each one and then several categories listed – just choose those that seem relevant to your question. If the fortune is unlucky then tie it on one of the strings nearby. The office closes around 4pm, unless there is a special event on. Don’t forget to take a wander around to the outer area of the complex where you may find a garden and more shrines. If you’re lucky enough to visit in May or August you may find that there is a festival on. The May festival, held on odd numbered years, is a huge traditional affair with drums and dancing. The August one I attended this year appeared to be more of a chance to have street stalls selling traditional dishes around the back of the temple and offer beer tasting, which is pretty fitting for a temple which is home to Ebisu. While there are shrines and castles aplenty in Japan the way that Kanda Myojin has responded to the changing needs of their worshippers while maintaining their traditions makes it particularly special and very much worth a visit.